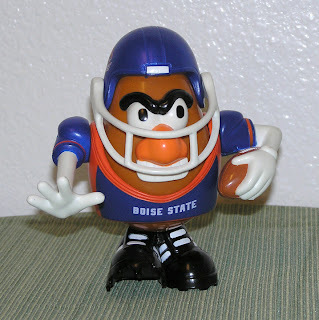 Boise State Mr Potato Head! Nice to have a toy that has local values. 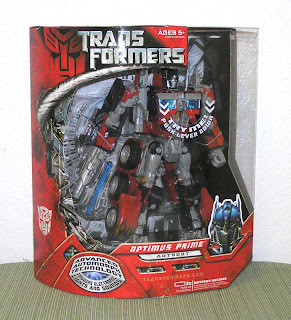 Movie Optimus Prime! So neat of a toy I'm Prospectoring Peteing it. Maybe on a rainy day I will open it. 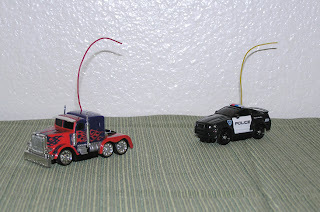 Radio Shack's Transformer Zip Zaps micro RC's. Very fun to distract the cat with. I rounded up the Ben 10 toys from around the house and got them to stand still for a quick family reunion shot. Need to work on Wildmutt's drool problem. 2008 will bring? Transformers Classics round 2! Xemot and Tomex! Probaly new Batman Dark Knight toys! Indiana Jones Legos! Marvel Attacktix series 2! A redesigned Toy Museum?--Ha-ha, I'm too lazy for that! 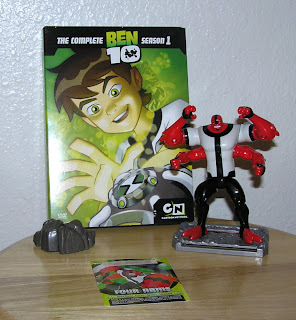 Thanks to family and friends I was able to receive several Ben 10 toys for Christmas! 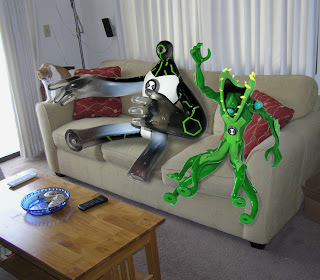 They immediatly took to the house though, leaving no space for me on my couch for watching TV! GhostFreak isn't being nice at all! 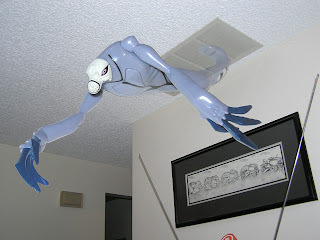 He ventured into the air ducts and comes out from time to time, scaring the hell out of me. I don't even want to start with Wildmutt. He ate some bad food in the lower crisper, and from now on the bathroom smells real bad! Perhaps I shouldn't have opened all of them so quickly. So thats what those guys look like when the stand up! Ah the AT-AT. My favorite Star Wars vehicle. I wish I had a better camera, with better lighting here at work. Oh well, still looks pretty good with a small snow storm in the background. First off, I ran into the funniest ad the other day for Target. It had the line of 'Peace, Love, Star Destroyers' with a little Lego Star Destroyer floating by. Second off. 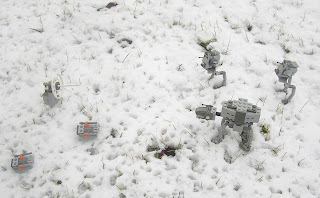 I like the Lego Star Wars games, but the Attack on Hoth level is not at all how I recall how it happened in the movie. I think I just killed a thousand AT-ST's, at least ten thousand Imperial Probe Droids, myself a Million times, and maybe a couple AT-AT's. The whole deal with grappling an AT-AT was fine, I like doing that, and maybe this game had the funnest grapple system I have ever used (except maybe the old schole wire frame game) Once you grab on to a leg you fly around a few times super fast, real springy and fun. But after you knock an AT-AT down, it can get back up!!! unless you grapple roll a ball bomb into it. And that is not easy, because as soon as you grab one bomb, all the little spawning Imperial Probe Droids attach a grapple to it too, then your playing tug of war with this ball bomb on the ground. By the time you pull it free from them, you fling the ball off into a far off distance! Then you go back for another ball, but by that time the AT-AT is back up and walking around! AARRRRGGGG! The spawing of AT-ST's and Droids is rediculous, they keep coming faster than you can knock them down. More and more and more and more, its totally crazy!!! I beat the level, but I have no idea how I'm going to do it with out lossing all the point pieces--ever time you get shot down, it takes collected point peices with you. Maybe I can buy that God mode cheat thing that the first Lego Star Wars had. I was surprised to see how large Bayblon 5 stuff is to the Star Trek stuff. however, Holy crap, V'ger is huge! It would be neat to see it fight the Whale Probe. 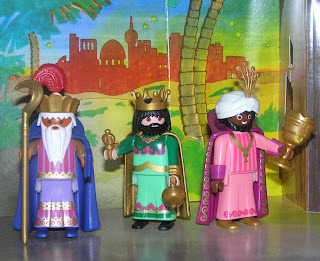 A Playmobil Christmas; Finally a Nativity set Dan can get along with! Playmobil's Christmas set has it all! 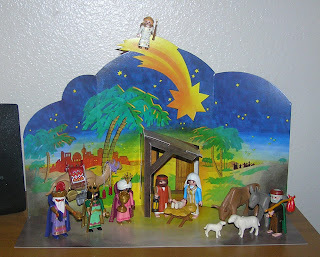 An upgraded Nativity with multiple figures, accessories, and enviroment! 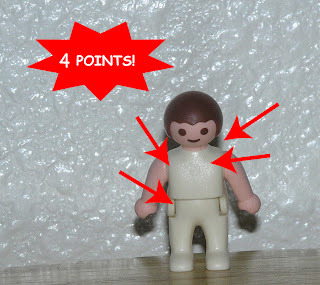 Jesus has 4 points of articulation!!! Just look at the fine detail as well. Those wise men didn't forget a thing! The only thing this Angel is missing is its Vorlon encounter suit (if you believe in Babylon 5 lore). Take one more look, and bring yours home today!!! I hope I don't get in trouble with the Great Maker over this post. Ah, the Centari, another great reference! Two cars, one dark the other light, both with red flames. Perhaps the galaxy's fate is up to the winner of the stongest of the two. And perhaps a spinning space station should be built, where a league of worlds could gather and fight against the two cars that fight and destroy everything around them. Hmmm, that would be cool. 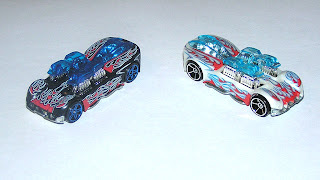 In all seriousness, both cars were Hotwheels Mystery cars. I guess one was in the package too long? One either sucked up the blackness of the packaging, or the other one bleached itself due to lack of nutrition. They both still move FAST, with four fake engines. Anybody notice the Dan's Toy Museum's ticker went over 10,000! Subtract the 9,000 times daily I visit, and that means I had 1,000 Visits! My latest favorite show is Ben Ten. Mostly because it is very similar to my life. I too have an Alien watch that transforms me into ten various Aliens. In some circles I am known as Dan Flan, which Flan roughly translates into ten in English. Four Arms! This is my first Ban Dai action figure. 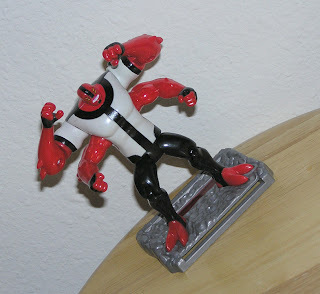 (Well not really my first, I have an original Red Ranger in package some where in my closet) Ban Dai toys usually don't hook me. The plastic is weird and "hard" looking. 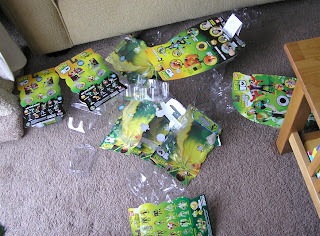 The toys also have an over dose of screw holes and fake joints. I'm thinking for Ben Ten it works in favor of the steamlined look of the show. 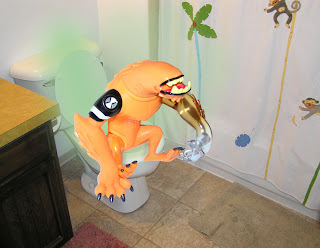 The colors and shininess also go good with capturing the aliens. 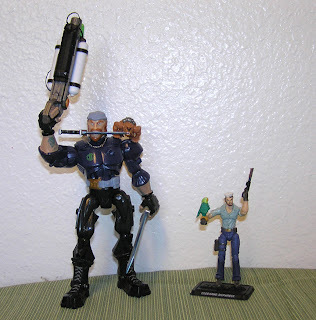 The price isn't bad for the 4" guys- about 4.99 each... thats 10 times 4.99 or 50 dollars for the 10 Aliens. Hmmm, maybe those would be cool x-mas gifts, Hint hint hint. 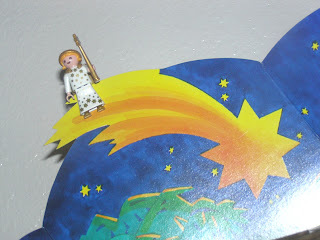 They would look good hanging around the nativity scene. 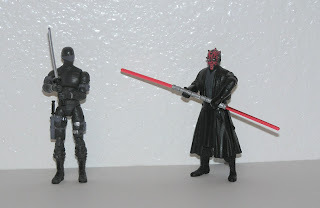 Darth Maul meets Snake Eyes! Dan's GI Joe casting ideas! I like that confirmed possible rumor of truth! As long as Snakes has the line; "At last we will have revenge!" I hope this continues a trend of better casting. Or at least, take all the old voice actors from the old cartoon and make THEM do the movie. Duke- Matt Damon - the resemblence is uncanny and Bourn fits the training. And thats my GI Joe movie cast! 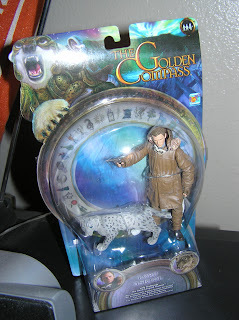 Should I jump on the Golden Compass bandwagon? Daniel Craig the action figure makes it appear like it could be an interesting story. Is it weird that I have never heard of the novels? Of course, I am not a well read person, spending most of my intellectual time pondering who would win in a fight; Kirk or Picard? The previews of the warring Polar Bears looks Dantastic. I will have to see this movie--of course I just saw the trailer for Alvin and the Chipmunks, and that is on the top of the list by far.